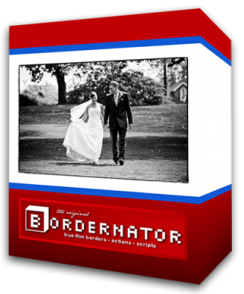 Bordernator.com has the sole discretion to provide the terms of payment. Unless otherwise agreed, payment must first be received by Bordernator.com prior to the latter’s acceptance of an order. Unless credit term has been agreed upon, payment for the products shall be made by credit card, paypal or wire transfers. Invoices are due and payable within the time period noted on your invoice, measured from the date of the invoice. An order may be invoice separately. Bordernator.com has all the discretion to cancel or deny orders. Bordernator.com is not responsible for pricing, typographical, or other errors in any offer by Bordernator.com and reserves the right to cancel any orders arising from such errors. Invoices must be paid within 15 days of the invoice date. For all but consumer purchases, Bordernator.com reserves the right to charge you a late penalty charge of 1% per month applied against undisputed overdue amounts or the maximum rate permitted by law whichever is less. Every 30 days thereafter, you will continue to be charged an additional late penalty charge. FRAUDULENT ACTIVITIES are highly monitored in our site and if fraud is detected Bordernator.com shall resort al remedies available to us, and you shall be responsible for all costs and legal fees arising from these fraudulent activities. You agree not to disclose information you obtain from us and or from our clients, advertisers and suppliers. All information submitted to by an end-user customer pursuant to a Program is proprietary information of Bordernator.com. Such customer information is confidential and may not be disclosed. Publisher agrees not to reproduce, disseminate, sell, distribute or commercially exploit any such proprietary information in any manner. Failure of the Bordernator.com to insist upon strict performance of any of the terms, conditions and covenants hereof shall not be deemed a relinquishment or waiver of any rights or remedy that the we may have, nor shall it be construed as a waiver of any subsequent breach of the terms, conditions or covenants hereof, which terms, conditions and covenants shall continue to be in full force and effect. This Agreement shall be governed by and construed in accordance with the substantive laws of Oregon, without any reference to conflict-of-laws principles. Any dispute, controversy or difference which may arise between the parties out of, in relation to or in connection with this Agreement is hereby irrevocably submitted to the exclusive jurisdiction of the courts of Oregon, to the exclusion of any other courts without giving effect to its conflict of laws provisions or your actual state or country of residence. 75 custom true film sloppy borders! Compare other less powerful products at $150.00. $19.99 is a STEAL!! All-in-one graphical interface–no actions to deal with! Subscribe to our newsletter and download a trial version of Bordernator for free! You'll get 3 free borders and be eligible for exclusive offers, news, & other great stuff! Bordernator is easy to install! First, locate your Bordernator ZIP file and extract the folder to a convenient temporary location. Open the Bordernator_3 folder & navigate to the ‘Bordernator_3\Windows\bordernator’ folder. 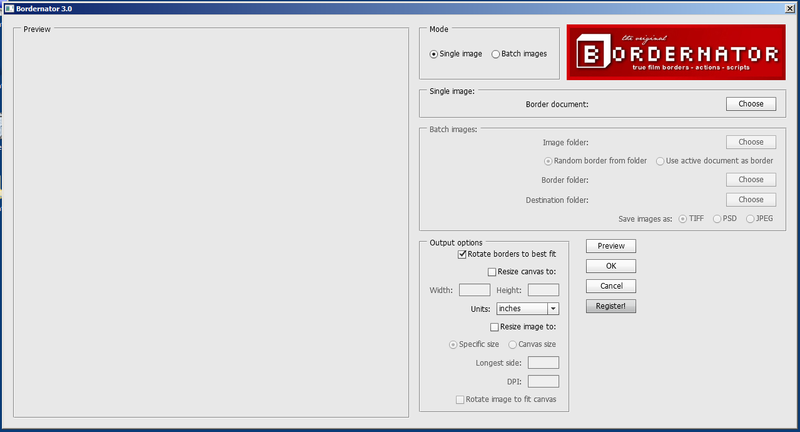 The Windows-specific version of Bordernator is contained within. In a separate window, locate your installation of Adobe Photoshop CS4-6. 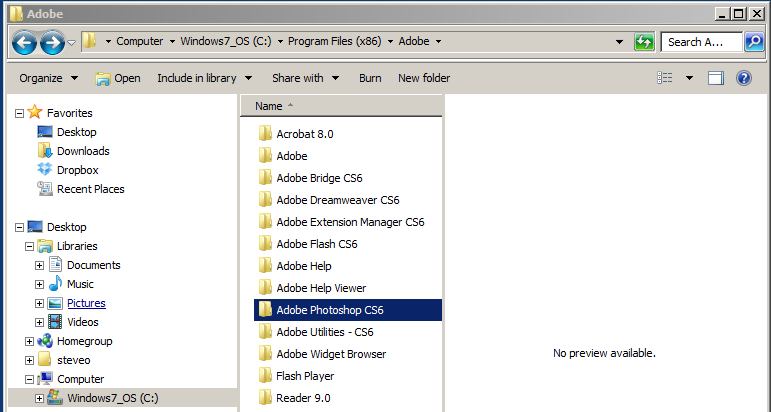 If you have trouble finding your Photoshop installation, use the Searchbar located in the Start Menu to search for ‘Adobe Photoshop’. 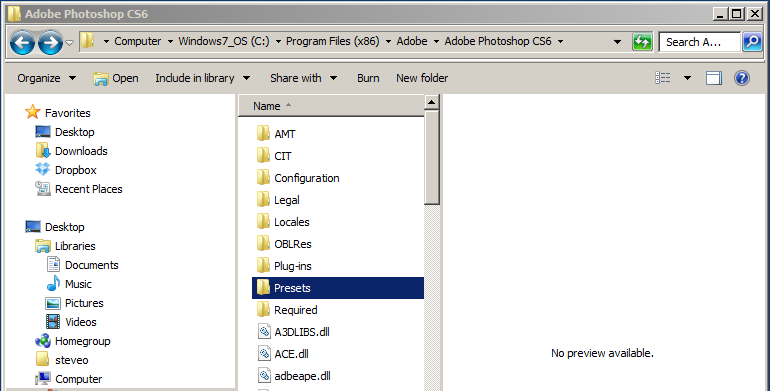 ‘Adobe Photoshop CSX > Presets’. 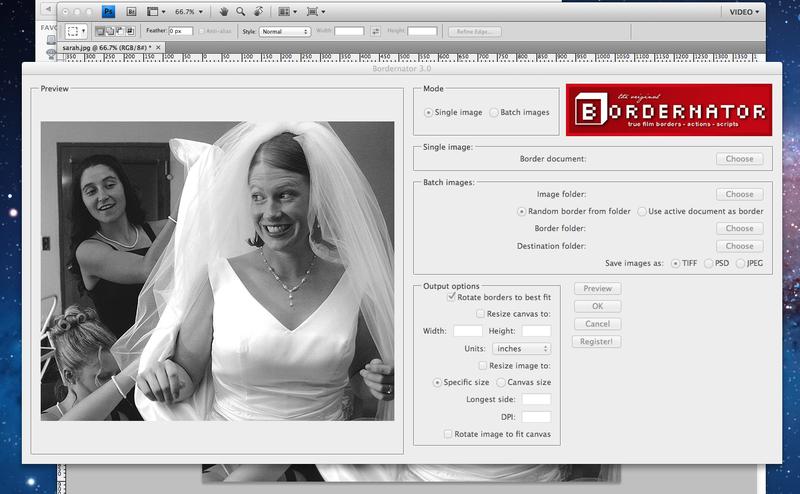 Copy (CTRL+C) the folder ‘bordernator’ from your extracted Bordernator zip file to the Adobe Photoshop ‘Scripts’ folder. Bordernator is now installed and ready to be used! The only step left is to register your copy of Bordernator with your license information. 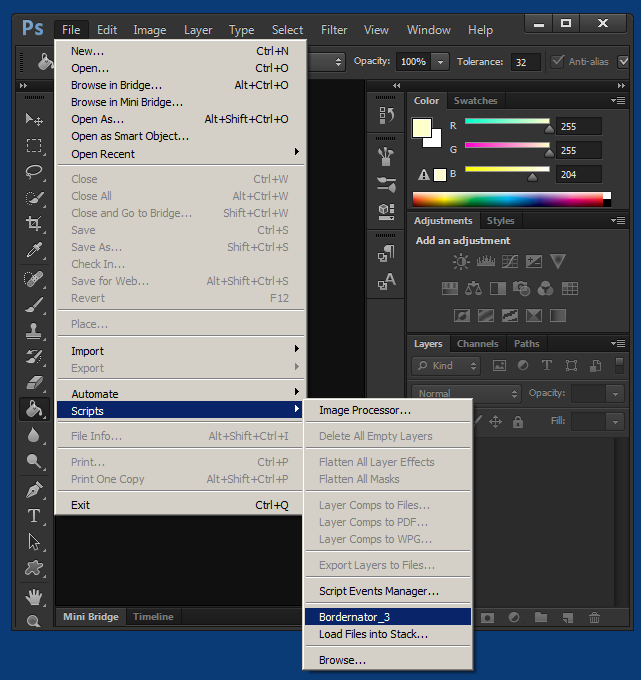 Open Adobe Photoshop CSX and click on ‘File’ in the upper left corner. Move your mouse down to the Scripts directory and you should see Bordernator_3 listed among the installed scripts. 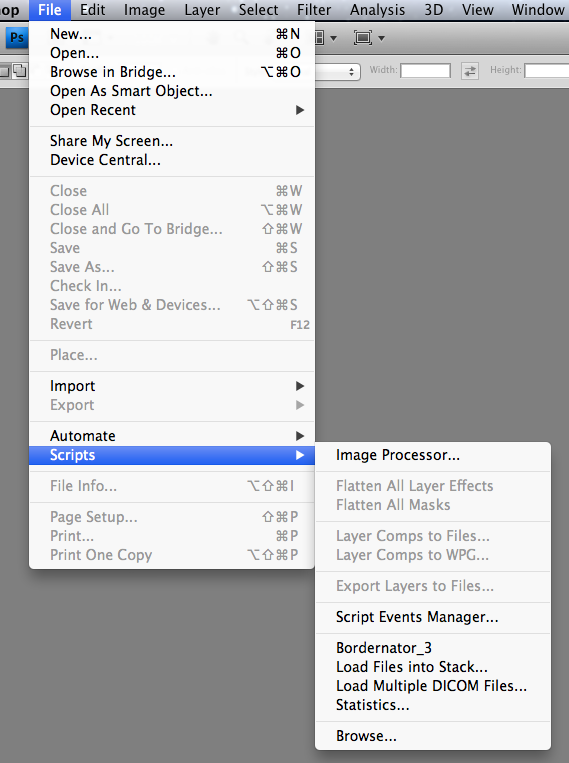 Click on ‘Bordernator_3’ and the Bordernator Script Box will open. The Registration popup box will appear. Fill in the details that you received in your confirmation email and press ‘Register’ when you’re done! If your information is correct, a box will pop up and tell you that your copy of Bordernator has been successfully registered! Your name should appear in the title bar of the Bordernator script box. Congratulations on successfully installing Bordernator! The first step is to download Bordernator (link available in confirmation email) and unzip it to an easy-to-access location. Open the Bordernator_3 folder and navigate to the ‘_MACOSX’ folder. 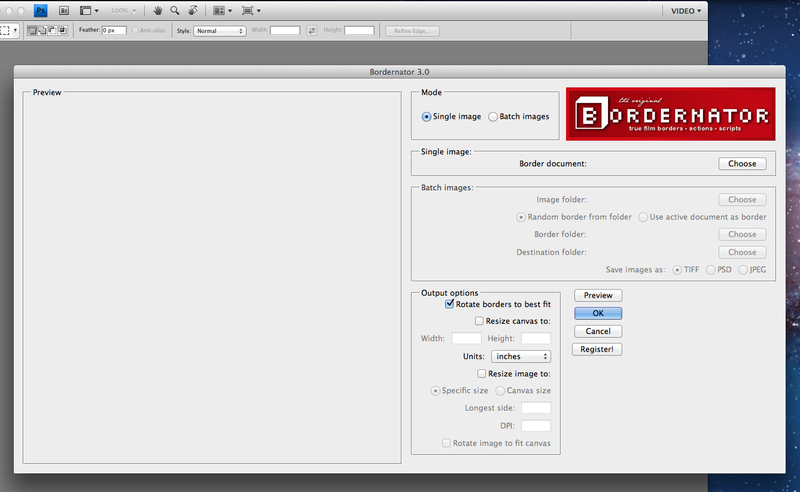 The ‘bordernator’ folder inside ‘_MACOSX’ contains all of the files that you will need for Bordernator. 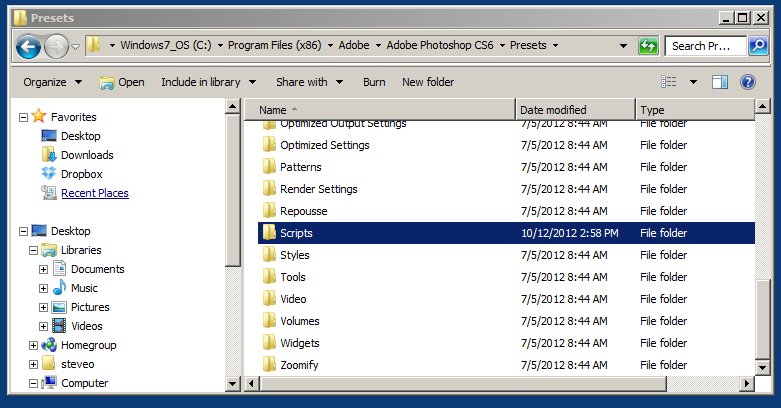 Copy it (CMD + C) and then locate your installation of Adobe Photoshop CS4-6. 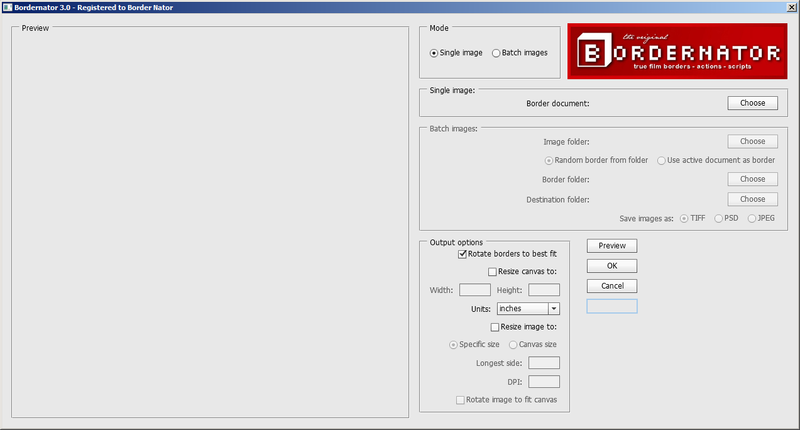 Paste the ‘bordernator’ folder into the ‘Scripts’ folder as shown above. Click on Bordernator_3 and the Bordernator Script Box should appear. To use Bordernator, your must have a valid license code (included in confirmation email). 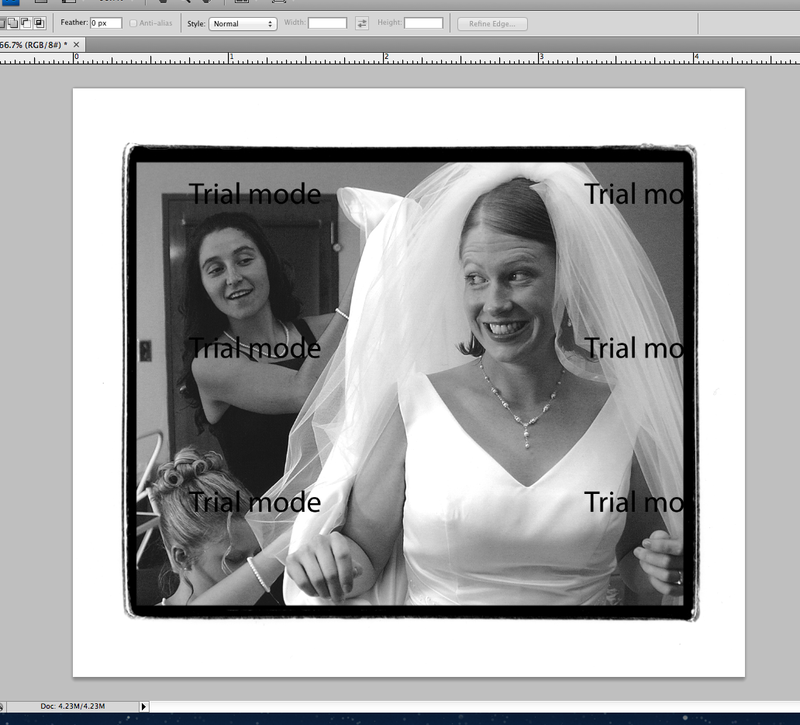 If Bordernator is not registered, all of your generated border images will display a TRIAL MODE watermark. 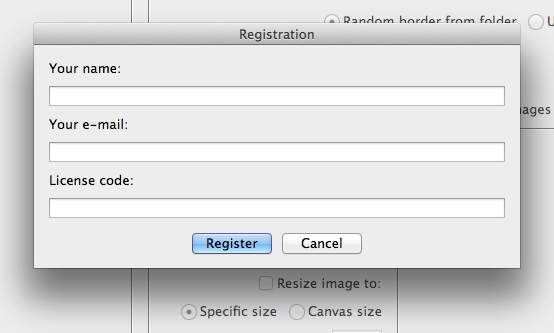 To register, click the Register button in the Bordernator Script Box and you will be prompted with a Registration box. Fill in the information you received in your confirmation email and click Register. 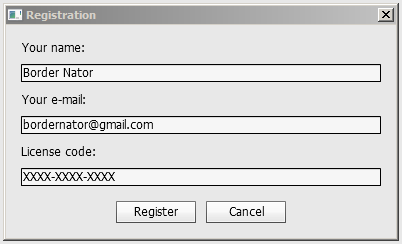 If successful, you will be greeted with a successful registration message and the Bordernator title bar will display your name. Congratulations! Your licensed copy of Bordernator is ready to use! Below are two instructional videos for installing and making the most of Bordernator.